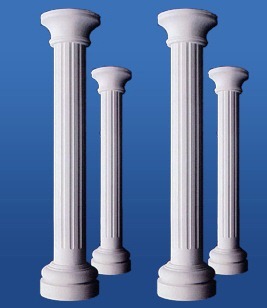 The Greeks had great pillars – Corinthian were my favorite – and they had the Oracle of Delphi. Many civilizations since have had their sages. I’m not one. But in my humble opinion, achieving success in this business absolutely depends on the roof having four essential pillars, and as you might guess, I’m about to hand ‘em to you on a silver platter… or at least in blog form. Now, mind you, these pillars are just as good for about any other freelance operation, but who cares about them?…we’re voice actors!! Baby, if you don’t have this, nothing else is gonna matter. You can’t learn it, you can’t earn it, you can’t buy it, and you can’t e-mail it. Ya either got it, or you don’t. The good news is, it’s easy to know whether you have it in VO-land or not. a) voice magazine articles for free for the blind? b) tweak the threshold, attack, and release on your noise-gate till it’s PERFECT? c) raid mom’s tip jar for the lat $10 you need to buy the mic you want? d) cut that phrase over and over and over until you say “arthroplasty” just right? e) stay up late reading Pro-Tools manuals on using the “scrub” tool? f) make 100 (ok, 50) phone calls to find the right ISDN installer? g) make ONE MORE COLD CALL after hearing “no” 75 times before? Get the idea? Almost no notion is too outlandish as long as it reasonably advances you toward your goal of absolute immersion in the business of voice acting…and only because it feels good to do so. OMG, there it is again! The word that appears in virtually every self-help, get-ahead, and tools-for-success scheme! But seriously, it’s there for a reason. There’s a stubbornness intrinsic in persistence. You’re unwilling to give in, ‘cause you absolutely, positively know beyond a shadow of a doubt that you’re right, or you’re good, or you’re the perfect voice for the job, or you have what it takes to land the gig. I’ll spare you the reminders about Colonel Sanders and his recipe of 11 herbs and spices (or is it 12?). Ho-boy, get in line for lessons in this! Americans are not known for their patience in any way, shape, or form. We want it, and we want it NOW! And yet, if you think about it… how often were you rewarded when you chose patience instead of impulsiveness, temperance instead of temper, cooool instead of callous? I know it’s hard. I KNOW!…and patience is not always the choice that wins the day, but more often than not, you will build your business and your relationships over time by BIDING your time. Even that definition falls short. Productivity means the above, yes…but it also implies a certain prodigious quality. Prolific. Abundant. The key is to be fruitful in quality,not just quantity…although there are moments for the latter as well. Productivity is writing one blog a day whether you want to or not (heh). Staying up one more hour to finish the project a day early and make the client REAL happy. Productivity is contributing something to the intellectual stream-of-consciousness – the dialogue of business. Productivity is humbly offering something of value for free again and again, just because it helps…someone or something. Productivity is sometimes finding that the doing of something is its own reward, and it feels good. Productivity is your legacy, your contribution to the whole, your essence, your WORK. YOUR work, your BODY of work. Whoopss!….there goes the soapbox… I hope you needed a pep-talk for the first of the year. I did. So I wrote my own. I couldn’t think of any resolutions for the New Year, so I guess, in a way, this is it. My manifesto…my motto…my mantra. Very good article. I am bookmarking this one to go back and use it to remind myself of these attributes throughout this year. You cover a lot of ground and if I can tackle one third of it I know the year will be a good one. Have a fantastic 2010 Dave.